Hot this week: Vandalism of statues of some the UK’s most notable figures, Queen Victoria and Clyde the terrifying Commonwealth Games mascot. I am organising a session at the Society for American Archaeology Meeting in San Francisco (April 15–19 2015). A bit last minute but if you are interested in joining in, 200 word abstract by this Friday. Follow link for call. The National Gallery of Australia’s own fraud assessment has determined that the museum’s risk of acquiring looted antiquities, even now after the Shiva scandal, is ‘medium’. The idea that it is hard to not buy looted objects is absurd. Any museum that would like to hire me to prevent y’all from buying looted antiquities, you know how to get in touch. Several coins, including an 1813 ‘Holey Dollar’ made from punching out a Spanish real, were taken from the State Library of New South Wales. Divers with metal detectors were caught trying to loot a known Phoenician wreck near Isla de Mazarrón. A complicated story that has to do with a French tradition of lending museum pieces to public buildings as well as an alleged French tradition of stealing those items. These works by Isaak Levitan were taken from a dedicated art museum in Plyos. Apparently the security system was functioning. If I am reading this correctly, this is the most comical outcome I have seen from a WWII restitution claim (to be fair, it isn’t a comical topic). Rather than having been taken from a Jewish owner under duress, this painting was seized by a Jewish-run bank from a full-on Nazi party member who put it up as security for a loan that he defaulted on. The bank seized the painting from the Nazi and got a fair market price for it at auction. Hot on the heels of the controversial (but profitable) sale of the Sekhemka statue by the Northampton Borough Council, rumours are swirling that Worcestershire is considering selling off some of its archives as the budget for libraries, archives and archaeological services in the county are severely slashed. I hope you all see that this is a bigger issue than one statue. Here for the absurdity. Someone stole an antique tractor from the Beamish Museum and used it to tear up a golf course. The Indiana Jones jokes write themselves in this story about a failed police bust to find a stolen ‘holy grail’. It is stolen cultural property, folks, it makes Culture Crime News. Also for the close-to-home absurdity. A statue of Glasgow’s terrifying thistleman Games mascot has been nabbed! The unidentified gem was recovered by police and given to the Department of Archaeology for identification. It was being held in a copper Kandyan Period vessel and the suspect told authorities that he found the gem (presumably in the vessel) while ‘digging up a treasure’ in the Inamaluwa area of Dambulla. A local politician was among a group of people arrested for attempting to loot an archaeological site. Well, those numbers are disheartening to say the least. If you are collecting Indian holy art…this is where it comes from. So maybe stop. Several youths smashed Queen Victoria statues in the Mathura Museum with hammers saying they wanted to destroy symbols of the Raj. This article was better before they changed it to put the word Taliban in the title but I guess they are slaves to the click bait. Passing mention that the primary chamber of the tomb had already been looted by the time archaeologists got there. It is unclear why they were attempting to block the archaeological excavation, but they were taken into custody after being questioned by the police. It has little to do with the story, but the title of this piece originally had the words “Monuments Men” in it but I removed it. Trust me, I did the female reporter a favour by scrubbing the offensive gendered title. Anyone who uses that or modern preservation efforts needs to stop. It is tired. I’m looking at YOU the media. ANYHOW a little piece on the Syria situation with some talk of artefact trafficking into Turkey. I have no idea how to gauge the veracity of information coming out of Syria so please take anything from there with a grain of salt. In this article, Syria’s tourism minister claims that revels are tunneling under the old city of Aleppo. An interesting piece on the effects of continuing sanctions against Iran. Iranian antiquities that have been out of the country for decades still fall under sanctions and thus import/export permits are few and far between in the US and Europe. I have to admit I laughed maniacally at this thought and I don’t really feel sorry for anyone trying to move ancient Iranian pieces around. Although several Yemeni news agencies have been reporting that an antiquities thief has escaped from prison, officials deny it. Why? Because they haven’t even arrested a suspect in the antiquities theft crimes so no suspect could have escaped prison. Ten funerary sculptures returned. This article is mostly photos. The tragic and brutal destruction of, well, every Maya site to feed the international art market. I highly reccomend following the hyperlinks to spectacular definitions of various terms written by, well, it is obvious who. Pretty much the only thing that ensures that a piece of sacred art will be returned if it turns up stolen and on the market is a clear government record of its existence (with photo). Mexico says it will take up to 8 years to update their register in Puebla alone! Sure, Puebla is pretty much constructed out of beautiful historic church art, but this doesn’t bode well in a situation where Latin American sacred art is THE hot thing to steal and sell. After quite a controversial (in some circles at least) sting and conviction, these Greek coins are going home. 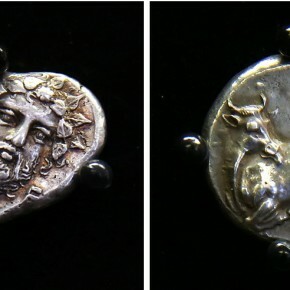 Dr. Arnold-Peter Weiss tried to sell these and other coins the Waldorf-Astoria and was caught on tape saying that he knew at least one of the coins had been recently looted in Sicily. A long piece on the rather shocking news from a little while ago about the open sale of the alleged remains of an American Civil War soldier. After the auction was shut down, the bones were taken to the Smithsonian for examination. Someone really loves Miranda, loves her so much that they painted their declaration in giant pink letters on Tamanowas Rock near Seattle. Controversial museum deaccessioning seem to be all the rage. The Delaware Art Museum has seemingly concluded that censure isn’t much of a deterrent. Discussion with Monica Hanna and others about the issue in Egypt. The 185 historic and ancient coins were taken off an Egyptian citizen on his way to Rome. And the first absurd story from the new US ivory regulations emerges: the very antique pipes that piped daily for HRH The Queen were confiscated from teenagers at the US/Canada border. Teenagers who, apparently, did everything right. Don’t get me wrong, an ivory ban is a good thing, but there are just going to be more and more stories like this.